Screeding without formwork is becoming a popular time saving technique. 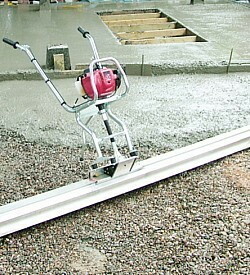 The Easy Screed has an easily detachable twin handle power unit that clamps on to beams of various lengths. The aluminium beam has a profile suitable for “free screeding” or by reversing the same beam can be used for striking off across from formwork. We can supply a 3 meter beam. Just click the Link Below.